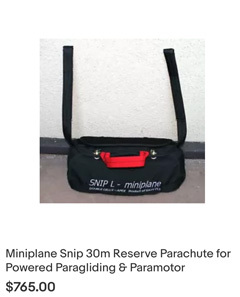 Powered paragliding products are specially designed for pilots that enjoy this unique form of flight. 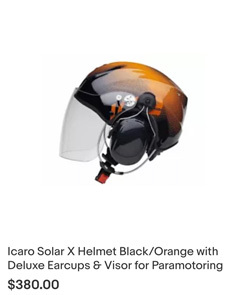 From PPG Com Helmets to Reserve Parachutes, Books and DVD's to Windsocks, we have the paramotoring products you need to fly safely and comfortably. 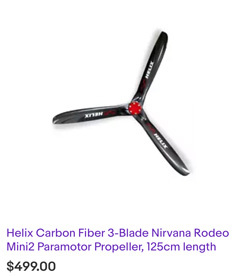 Always make sure you have a spare Propeller along with you, or your weekend could be cut short in the blink of an eye. Powered Paragliding Instruments make the experience just a little better, sometimes a lot better! TrikeBuggy specific Innovations, Accessories and Parts are specially designed and machined products that make our unique little aircraft possible! If there's something you would like to see us carry, just drop us an email at Info@TrikeBuggy.com and we will see if we can find it for you. Blue Skies! 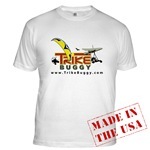 Now you can order TrikeBuggy Shirts, sweats, caps, mugs and more from our new T-Shirt Store! We'll be adding more designs soon, but for now, there's the TrikeBuggy logo on everything! 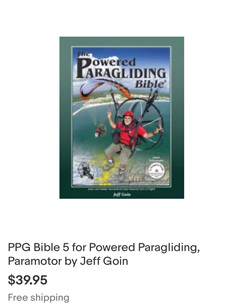 A must for all pilots, beginner and advanced, this DVD covers fundementals that are certain save wear and tear on your equipment, your body, and your wallet. This book is the most thorough manual ever produced for our sport, offering a concise treatment of subject matter for anyone serious about flying. It will be appreciated by those just learning as well as those wanting to master the sport, to explore all it has to offer.